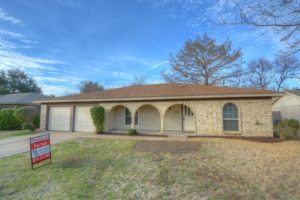 – This beautiful home in Martin HS district has new windows & custom blinds. Remodeled kitchen showcases large breakfast bar, granite counters, tumbled travertine backsplash, under-mount sink, & stainless appliance pkg including range, dishwasher & microwave. New 12×18 tile flooring in both baths, kitchen, dining, entry & utility area. Home also features new granite counters, sinks, & toilets in bathrooms, new carpet, & pretty 3-tone interior paint thru out plus new light fixtures, backdoor, cabinet & door hardware. Large covered patio overlooks nice-size backyard and new fencing. Roof 2 years old. Foundation repaired with transferable lifetime warranty. New sewer drain lines under house. Be sure to see this one! If buyer has local house to sell first, owner will consider trade in.